Bugaboo International is recalling more than 50,000 of its Cameleon and Donkey strollers in the United States and Canada because its handle can detach and cause an injury to a child. Bugaboo said Tuesday that a button on the stroller's seat carry handle can disengage and cause the handle to detach. That could mean a young child could fall or choke. 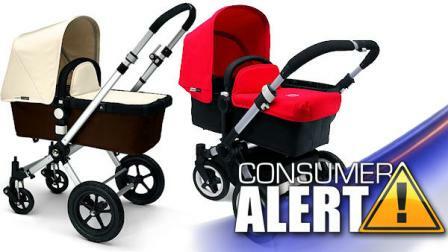 The Bugaboo Cameleon stroller being recalled, was sold between September 2009 and June 2012. The Bugaboo Donkey stroller being recalled was sold from January 2011 through December 2012. If you have one of these affected strollers, please immediately remove the carry handle from the stroller. You can contact Bugaboo for a free replacement handle by calling their toll free number at (800) 460-2922. You can also continue to use your Bugaboo stroller while awaiting the replacement handle. The serial number can be found on the stroller's chassis, under the carrycot/seat.